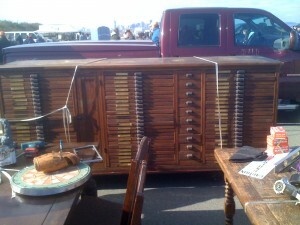 I bought my first (and only) Hamilton printers cabinet (see picture here) several years ago at the Alameda Antiques Fair in Alamaeda, CA, which I attend regularly. Then I bought an early Hamilton Manufacturing Co. Catalog on eBay, and it really opened up my eyes to the variety of heavy-duty furniture the company made. I scanned the catalog and put it on the web so everyone could see it – just click the link at the bottom of this page. Look through these pages – this was America at work. Working hard to make high quality products to be used by other people who were working hard, with both their bodies and their brains. i think its amazing that not only did you find the catalog for this cabinet but that you scanned it in and posted it! i also have a cabinet from the american cabinet company but mine is a dental cabinet circa 1920. ive been searching everywhere for a catalog from that time so i can identify exactly when it was made but your catalog is the only one ive been able to find. do you still by chance have the contact information for the party you purchased this catalog from? if you do id greatly appreciate having it. thanks!!! Just bought a steel Hamilton printers cabinet / table. Built like a tank, eight foot long, with a cast iron top! It came out of a Machine Shop and is as dirty as can be – once the weather breaks this guy gets a full cleaning and metal restoration. Based on what I have found so far it is post 1912, do you have any info on the metal furniture Hamilton made? I have a Hamiltton Mfg. Co. 5 section wood cabinet #32123. It has 16 total drawers. It’s not a printer’s type cabinet; as the alphabet goes from A thru U only. It measures 34 1/2″ wide X 21 1/2″ deep X 44″ high. We think it was used for small parts, because that’s what was in the drawers when we purchased it. Any information you might have, I would greatly apprecaiate it. Any info you might be able to give me would be greatly appreciated.